As a Stay At Home Mom, you sometimes fall into the trap of assuming you can do a bazillion things because you aren't "working". The problem with that assumption is forgetting about the reason you are staying at home in the first place: You have kids. And kids and to-do lists are SO not compatible. Unfortunately, you can't really pitch either of them, so you have to find a way to keep the kids occupied and get your stuff done in the most efficient way possible. 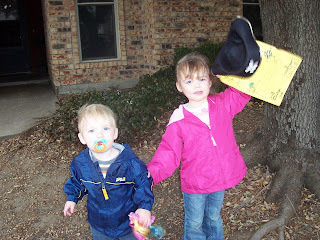 This past Monday I had quite a few errands to run and two very unwilling kids. 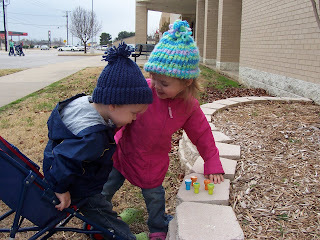 I needed to go to the bank, to the grocery store, to the library and all the kids wanted to do was play at home. Tot went so far as to say "I want to STAY AT HOME. I do not WANT to go!!" Which is nice, because it means that your home is a good place to be, but when you have to do things that will keep you out of that home for a good two hours, you are kindof up a creek. Thus, the creation of "Adventure Day." Getting as excited as I possibly could, I asked Tot if she wanted to go on an Adventure. "An Ahventoor?? YEAAAAAAA!!" I asked her how she felt about a Pirate Adventure. "Piwhat Ahventoor???? YEAAAAAA!!!" I took that as a green light and 5 minutes later we had a plan. Pirate Park - to go on a treasure hunt. Needless to say, the kids were geeked. So we loaded up the car after having our fill of Pirate Pancakes, and off we went, taking pictures of our stops (well, not the bank, I couldn't get a good picture of us in the drop off line). 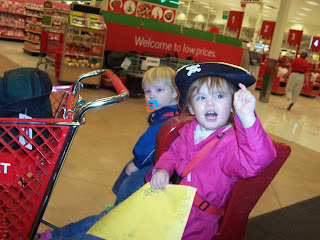 After we got to TARGet (loving that, by the way), Tot kept ahold of the treasure map and directed us through the grocery shopping. We all know that pirates need their lunchables and goldfish, after all. The kids were exceptionally well behaved and while they weren't looking, I stopped into the dollar section and picked up some cute ink stamps to use for buried treasure. After TARGet, we stopped at home to unload the groceries and have a quick Pirate Snack. We wouldn't want those tiny Pirates to go low blood sugar, now would we? But soon, we were once again loaded up and ready to go on a Great & Mighty Treasure Hunt. My first choice was the park behind our library, but WOO was it cold and windy. So, like the quick thinker I am, I took the kids to one of the trees in front of the library and discreetly hid the stamps in the mulch. I am a beast. Tot and Little David both scrounged around the mulch and found the stamps in record time and were suitably impressed at their Booty. Then we went to the library and found scads of books and movies and then I left for home with two very tired Pirates. We had a nice warm lunch, and then I set Little David down for his nap, and let Tot play quietly in her room with her new found treasures. And that was a mistake. 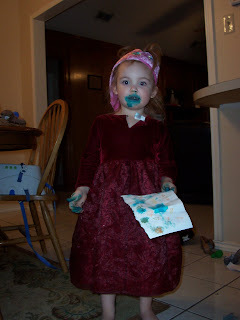 I didn't get that stain off of her mouth and hands for at least 48 hours. Ugh. Regardless, I got all my errands done in record time and the kids had a great day that the Tot is still talking about days later. I'd say that's a pretty strong Adventure. And THAT is why you are Unsinkable, Friend. What a great idea, Kristen! You are a wonderful Momma. Love the picture of Tot, sounds like Johnny and the "permanent marker fiasco". I love the TARGet reference! Have a great day! You inspire me! Monkey isn't quite old enough for those types of adventures, but have no fear, it's tucked in the back of my little brain to be pulled out and used in a dire situation like yours. Thanks for sharing! Love it! Totally steeling this in a few years. And now everytime I drive by Target it will mentally be T-ARRRR-get. Um...thanks. You are a brilliant mom! Pirate Adventure Day is inspired. "And kids and to-do lists are SO not compatible." You are so creative and such a fun mom!! Adventure Day - What a fantastic idea! I'll have to borrow it sometime.